Name: Name bestowed on the family by the King of Ireland as Cearbheoil -- (pronounced kar'el) believed to be from Gaelic for "hacking" (as with a sword) or perhaps "slaughter", preferably "Champion Warrior"
Shield:T wo golden lions rampart with a silver sword between in a field of black. There are many variations to this scheme with different branches of this family. Battle Cry: In Fide et in Bello Forte (or fortis) "Strength in Faith and in Battle"
The family name of Carroll is Gaelic Irish, originally Cearbheoil.3 Bryen Boironhe, Monarch of Ireland, gave the family the name CARROLL in 1027AD.3 The Carroll coat of arms included a sword (symbolic of military service); with two golden, rampant, lions (symbolic of courage and strength); in a field of black. 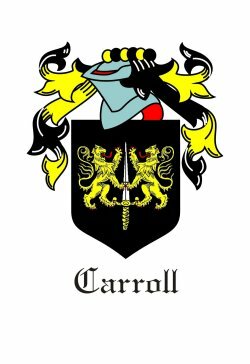 Carroll is an Irish patronymic name, Anglicized from the Gaelic Cearbhall, a given name of uncertain origin, but likely derived from cearbh = hacking...which probably described the use of a weapon. Colonial Carrolls settled in other colonies as well. Some came from their Maryland homes. Others like my 3rd Great Grandfather Carey were in New Jersey, and later moved through Pennsylvania, Carrolls migrated westward via the Valley that ran from Pennsylvania to North Carolina, and down the Ohio River Valley. The Carroll line spread throughout the Midwest and Upper South. William Carroll of Pennsylvania, became the Governor of Tennessee. Another William H. Carroll was a Brigadier in the War between the States. Our line is believed to be traced to 18th century New Jersey and our first known American birth of Carey Carroll in about 1784, and of his father's home in Millfen, Pennsylvania. Some go further to link this family to the Carrolls of Salem Massachusetts in the first settlement--though I have not found sound evidence of that connection. The genealogy I will show below begins with Carey's grandfather, Daniel, who sired Carey Carroll at the end of the Revolution. My father told me of the old Family Bible kept up in Northern Kentucky, and that Charles Carroll of Carrollton was listed in it. I can find no direct kinship, other than clan, to Charles Carroll of Carrolton. However, in research in the Maryland Holdings at the Frederick Library, it was written that Charles Carroll visited occasionally with a Carroll kinsman, a farmer and Revolutionary War soldier in Pennsylvania after the war. It is worth noting that Mifflin sits directly north of Frederick and Carrollton by some 120 miles via Harrisburg. In Morris County, NJ, there were two regiments and one battalion of militia rasied, and several battles in and around the county. All able-bodied men comprised the militia, and so I fully expect that James and his brothers served and fought during the war, although I find no Carroll names listed in the NJ records. Carey married Ellen McMillen (McMullen) in Mifflin, and later in Ohio, the Carroll girls married McMillen men, and so there is likely a family connection that continues today. Carey's son, James, traveled to Indiana and in Clark County, (across from Louisville) where he married Hanna E. Blizzard. (The Blizzards had come to Indiana from the South Fork of the Potomac in current day West Virginia.) James and Hanna moved to Brown County. Carey and his son James were listed in the 1850 census. township of Lewis not far from the River. William Taylor Carroll was born in about 1847 in Ohio. The son of James Carroll (b Penn in abt. 1816) and Hannah (b. in IN abt 1820). He appears as Taylor in 1850, and then as F Wm. T. Carroll on the 1860 Brown County, Lewis Township, OH census. His siblings were Elizabeth (Ellen) 1843, Mary M. 1845, Sarah J. 1850, Lenora A. 1852, and Columbus 1854 (this name appears in another branch of the family in Pennsylvania). The Carrolls moved across the Ohio River and were on the Bracken County census in 1870. James had died. Hannah is living with her daughter Sarah, and Ellen is two houses below. William may be listed as Florence on this census (perhaps for King Florence O'Carroll of Tipperary 1205) He, however, is listed as William T. Carroll on the 1890 Veterans Census in Versailles, and his Knights of Pythias ceremonial sword is inscribed with "Wm. T. Carroll" He is buried in the Versailles Cemetery under KOP rights. I was later inducted with that Sword into the same Gray Lodge. 1. Translated by Kuno Meyer, Journal of the American Historical Society, as cited in Carroll below.